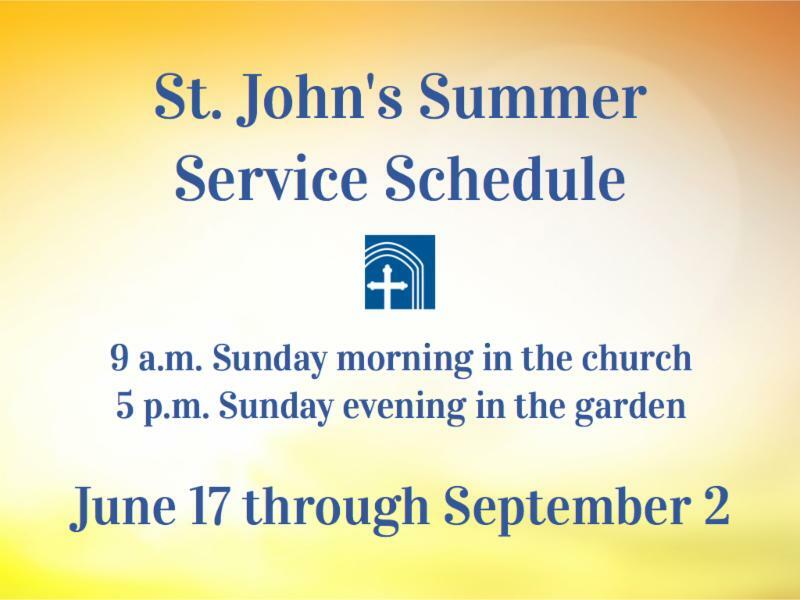 NOTE: Summer parish office hours are 9 a.m. to 2 p.m. Monday through Friday. Our Christian education programs for children and youth are in a time of transition as we say good-bye to several staff members. Janet Babbitt, who will continue as an active St. John’s member with her family, left her position as director of religious education on July 15. Mary Scripko, our part-time religious education assistant, has also decided to step back from her work at St. John’s to focus on her primary calling as a musician. She wrote the letter below to the parish. The search committee for a new Director of Religious Education position continues to seek applicants. Please share the job listing with anyone who might be interested. After careful thought, I’ve decided to step back from my position working with all ages of kids at St. John’s. Music has always been my first passion and priority, and as I grow my business as a teacher and performer, I need to put my efforts toward fulfilling that calling. The past three years at St. John’s have been truly life changing for me; I’ve met colleagues who are friends, friends who have become like family, and some of the best kids on the planet. I even got married here! I look forward to popping in from time to time for different events to see you all and catch up. Please keep Kevin and myself in your prayers, as we will keep you all in ours. Update on our Sunday Service Live Stream – Subscribe today! 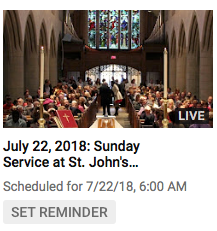 Just a reminder that if you can’t catch us in person during the summer, you can watch the morning service live on YouTube, or at the same link anytime later. We currently have an online congregation of around 50 people (between the live stream and podcast). It’s a great way to connect right from home! Click here for access to our YouTube channel, with live stream and service archives… and better yet, the option to subscribe. Volunteers to help maintain the garden by weeding, planting new crops and harvesting. Volunteers to pick, wash, bag and distribute veggies on Tuesday mornings. We especially need help on Tuesday mornings in August. To sign up for garden maintenance, look for a sign-up sheet at coffee hour on Sunday, or sign up online here. You may pick a week that you’re available and come in any time during that week. 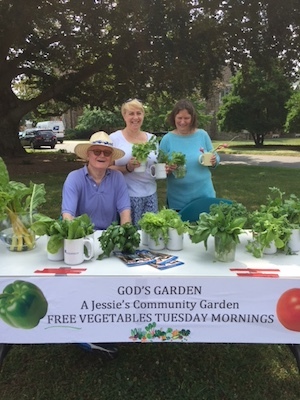 To help with Tuesday morning veggie distributions in August, contact J.P. Evans at jpfootball63@gmail.com or (860) 436-7967. You may direct other questions to J.P. as well. 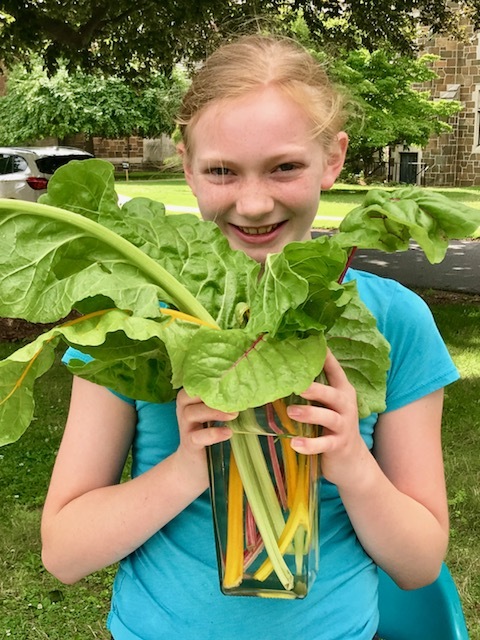 Also, as of today (Thursday, July 26) we have some leftover veggies from Tuesday’s distribution that weren’t given away. Feel free to stop by during office hours (9 a.m. to 2 p.m.) to pick some up. Anyone, age 8 and up, is welcome to experience the joy of singing in our choir during the month of August at our 9:00 service. This is a great opportunity to see what it is like to sing, without the commitment of a midweek rehearsal. A core of our regular choir members will be present and singing to help you feel confident and welcome. Join us on any Sunday during August at 8:15 in the church for a brief rehearsal to learn the Offertory Anthem for the day. 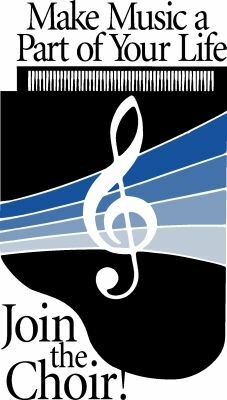 You can just show up, or contact Scott at music@sjparish.net for details. 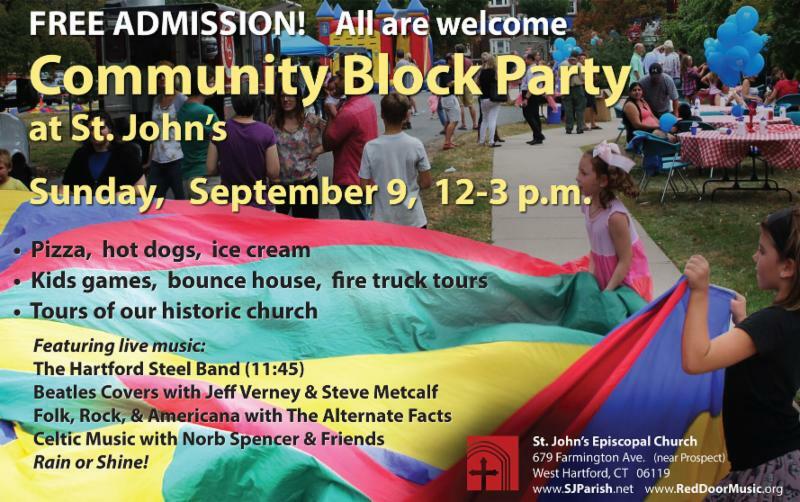 Save the date for Block Party 2018!